In this tutorial, we are going to start by covering the absolute basics of routing/navigation in Vue, and then we are going to look at how to navigate through an Ionic application using Vue. It’s simple enough to include Ionic’s web components in a Vue application (or anything else) just by dumping them into the template as you would with Angular, but things get a little more complicated when we want to navigate between pages. In Angular, we would just use the NavController that the ionic-angular package provides, but with Vue we will be relying on Vue’s own routing. NOTE: Ionic 4 (which allows us to use Ionic outside of Angular) is still in early alpha – please keep in mind that this is somewhat experimental and certainly not production ready. This is similar in concept to Ionic’s <ion-nav> component that serves as a container for navigating between various pages. Whatever view is active will displayed wherever this <router-view/> tag is. This defines all of the “routes” for the application. If you are used to using Ionic (opposed to vanilla Angular) then you may not be familiar with defining explicit routes like this, but the concept is pretty straightforward. We need to supply a path which will be the URL associated with the page, and a component that specifies which component should be used for that page. We can add as many routes as we like here by adding additional objects to the routes array. 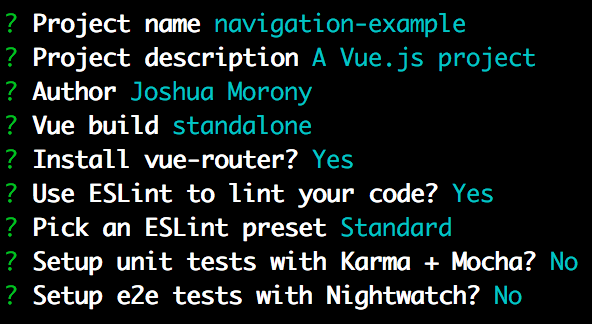 This is set up by default when using the CLI so it’s not something you need to particularly worry about, but it is important that it is included when instantiating a new Vue application. Remember, this is an early alpha version of Ionic 4 that is being included. This alone is almost enough to get us up and running with Ionic, but there are a couple more steps. If you attempt to view the application on a mobile device, it will not scale properly. In order for the application to display properly on mobile, we need to set up the viewport correctly using a <meta> tag. We can get the tags we need just by copying them from a normal Ionic/Angular application. You should add any Ionic components that you want to use to the ignoredElements array – you don’t need to include Ionic components that you are not using. Now that we can use Ionic components in our Vue application, let’s “Ionic-ify” our existing HelloWorld component. Now we are just using Ionic components as we usually would to create the template. We have also set up a @click handler that triggers the goToDetail method. This will push the detail page, but we haven’t created that yet. As you can see, this isn’t all that dissimilar to Ionic/Angular. Instead of triggering our method with (click) we use @click, and instead of pushing with the NavController we are pushing through the $router. It looks a little different, but the same basic concept is there. We are attempting to push this “Detail” page but we haven’t actually created that component yet, and we haven’t set up a route for it. We are going to do that now. This component is quite similar to our HelloWorld component, just a little simpler. This time, we are using the <router-link> tag to link back to the home page. In an Ionic applicaiton, you wouldn’t typically use a text link for navigation like this, but I wanted to demonstrate this method of navigation. With the component defined, let’s create the route for it. We are importing the Detail component that we just created, and then we set up its route. Now we can navigate freely between our two Ionic pages in Vue. We can now navigate between two Ionic pages in Vue, but if you run this code you will probably notice that the transition occurs instantly. This can be a bit jarring, as there is typically some kind of page transition animation when transitioning between two pages. This is something that Ionic handles for us automatically in Angular with the NavController, but we’re not using that here, so what can we do? Fortunately, Vue has pretty good support for performing transition animations like this. In order to set up a global transition animation, we will be using one of the examples from the Vue documentation. We have wrapped the <router-view> in a <transition> tag, which can animate components as they enter/leave. We attach an animation called “slide-fade” to that, which is defined in the style tag for the component. After making this modification, if you were to switch between the pages in the application you should notice that the transition is now animated. This isn’t quite as nice as the default transitions that Ionic provides in Angular, but you can use more complex transitions if you like – it’s just a matter of defining the animation appropriately. If you prefer, you can also set up specific animations for specific pages, rather than having a single global animation. For more information, I’d recommend taking a look at this guide. The key differences between navigation in Ionic/Angular and Ionic/Vue is that we need to define our own routes in Vue, and we also need to handle the page transition animations since we aren’t relying on the NavController. Aside from a few minor differences, though, the basic concept is more or less the same as navigating through an Ionic application in Angular.